The most recent skirmish on the Patriot Act reauthorization battle ended badly for civil liberties. Despite passionate speeches all around in the Senate Judiciary Committee public hearings and classified briefings, in the end, only Senators Feingold, Durbin, and Specter stood up for the Constitution. As Marcy Wheeler says, we got rolled. 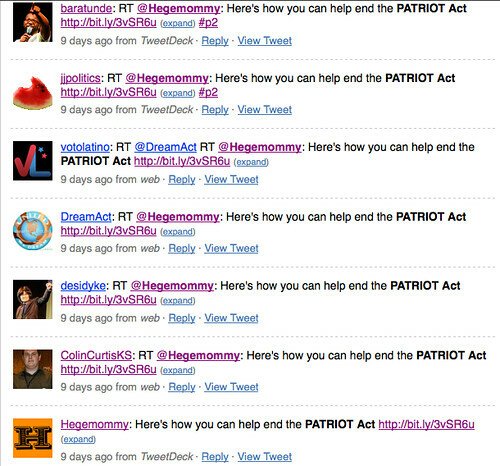 At the same time, though, the social network activism I discussed in Can Skittles fix the Patriot Act? and on the Get FISA Right blog highlights the opportunity to broaden and recharge the civil liberties community. provide a way to engage with Millennials and other diverse groups of people who care a lot about the Patriot Act — but are not currently involved with civil liberties activism. make it easy for people to let their politicians know their feelings — and recruit their friends in the process. allow civil liberties organizations to get beyond the media blackout and provide accurate information to everybody. It’s a powerful narrative. Social network sites epitomize the wave of the future, Obama’s strength in 2008, and youth. They’re overwhelmingly in favor of civil liberties. And civil liberties supporters are getting organized there. As we continue to make progress, every political consultant and politician thinking about a primary or general election challenge in 2010 or 2012 will be paying attention. 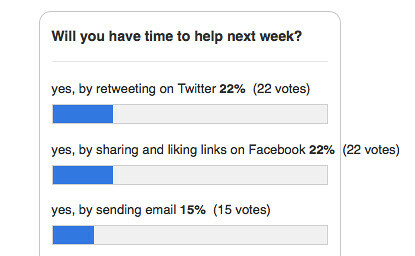 Social network activism for civil liberties has made great progress so far. Some simple steps from organizations and bloggers can take things to the next level. Before getting to the suggestions, though, I’d like to discuss the diversity aspects in a little more detail. The Get FISA Right poll matches well with the trends described in Jessica Vascalero’s Wall Street Journal article The End of the Email Era. Social networks are now as important a communication mechanism as email. Millennials in particular are very hard to involve via email. And the snapshot of the retweeting stream at the end of this post is a great illustration of the point Tracy Viselli and I have been hammering away on all year (1, 2, 3): Twitter is a place to engage with women, people of color, migrant rights groups, and others who are marginalized from other forms of activism. I mean really, what activism campaign wouldn’t want to have people like @Hegemommy, @ColinCurtisKS, @desidyke, @dreamact, @votolatino, @ColinCurtisKS, @jjpolitics, and @baratunde advocating our cause to their friends and communities? Talk about a #diversitywin! They’ve all got important battles of their own, of course; but they spend so much of their time on social network sites that it’s very easy for them to tweet or share something and help out when they have a few seconds. Civil liberties organizations’ action alerts today invariably push people towards email- and phone-based feedback to legislators — ignoring social networks. In some ways, this isn’t surprising. There are huge generational differences in attitudes towards social network sites — and most progressive bloggers and professional civil libertarians are over 30. And from a privacy perspective, Facebook and other sites are creepy panoptic environments that institutionalize tracking and behavioral targeting. So it’s not a matter of bad intent. The #1 recommendation from the Computers, Freedom, and Privacy “birds of a feather” session on New Strategies for Fighting FISA and the Patriot Act was to build a broad-based coalition — including students and migrant rights groups amongst others. And not to sound like a broken record or anything, but: social network sites provide a unique opportunity to engage with diverse audiences. Organizations like ACLU, EFF, and the Cato Institute are becoming increasingly effective at using social network sites. Combined with Get FISA Right and our allies, we have solid presences on Twitter, Facebook, MySpace, Organizing for America, Care2, Change.org, and in the progressive blogosphere. The challenge now is to leverage this strength and turn it to action. Here are a few suggestions to kick off the discussion. for civil liberties organizations, including Twitter, Facebook, MySpace, information in action alerts could broaden reach significantly. Providing social network-specific ways of contacting politicians (act.ly, a Facebook app, etc.) would similarly get a lot more people involved. progressive and libertarian bloggers and new media should include links to activism information when they cover the story. Twitter is a particularly attractive place for civil liberties activism right now. 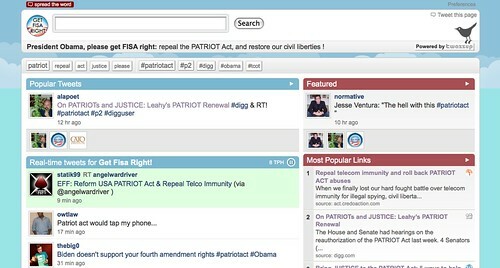 Civil liberties organizations and bloggers should get in the habit of using the #patriotact hashtag; retweeting important information and action alerts;taking advantage of technologies like Twazzup, act.ly, and 2Gov; and engaging with the people who show interest. as Chip Pitts, and Sarah Burris pointed out in comments on an earlier draft of this essay, social network activism is an ideal complement for and local in-person organizing. Somebody needs to take the lead on putting this all together — and then replicating it in all 50 states. Get FISA Right’s online and phone organizing meetings involving social network activists, bloggers, and non-partisan organizations have led to sharing value information and creating and deepening connections. More of this, please! The Patriot Act battle’s far from over. Representatives Conyers, Nadler, and Scott have introduced some much stronger Patriot Act reform legislation in the House, and there’s still the floor debate the Senate. If you look at the votes from 2008 and the seats that have changed hands since then, we have a chance to win this one if we get organized. And if we get really organized, well, there are at least a handful of seats where the civil liberties vote could make the difference in a primary or general election: Harman, Specter, Reid, Feinstein, Leiberman …. So our leverage will only increase. Social network activism has proved very successful for civil liberties (Strange Bedfellows, Get FISA Right) and other causes (Jena, Join the Impact, the DREAM Act, Obama). Now’s the time to take things to the next level. Posted by jon on Thursday, October 29th, 2009, at 10:44 am, and filed under political, social computing, Tales from the Net. to the Get FISA Right members and our allies for the hard work. I honestly believe we’re making progress! to Sarah in Global Comment, Maegan on Wilshire and Washington, Julian at Cato and everywhere else, Marcy at emptywheel, Jessica and Tracy on Care2, Rebecca, Harry, the various Jims, and all the others who covered the activism and the issues; and to Kevin, Michelle, Mandy, Chip, and all the other folks from “the coalition” who worked with and linked to us. to Harry, Colin, Tracy, Jessica, Ari, Chip, Jen, Doreen, Kyle, Sarah, and Deborah for feedback on the previous drafts. This is likely to be my last activism post for a while, as I focus on my startup Qworky. Thanks to Pam and Jason for giving me the opportunity to explore these ideas over the last year on Pam’s House Blend and The Seminal! And a tip of the hat to Join the Impact and the “Stonewall 2.0” movement, the DREAM Activists, Color of Change, and the #iranelection protestors for showing what’s possible … and most of all to Deborah for the original vision of the transformative power of social network activism for civil liberites.